Should You Brine or Pre-Salt Your Turkey? Every year lots of articles come out about "how to brine a turkey" just in time for Thanksgiving. There are people who swear by brining, to be sure, but not everyone brines. So, should you brine your turkey? Only you can decide. 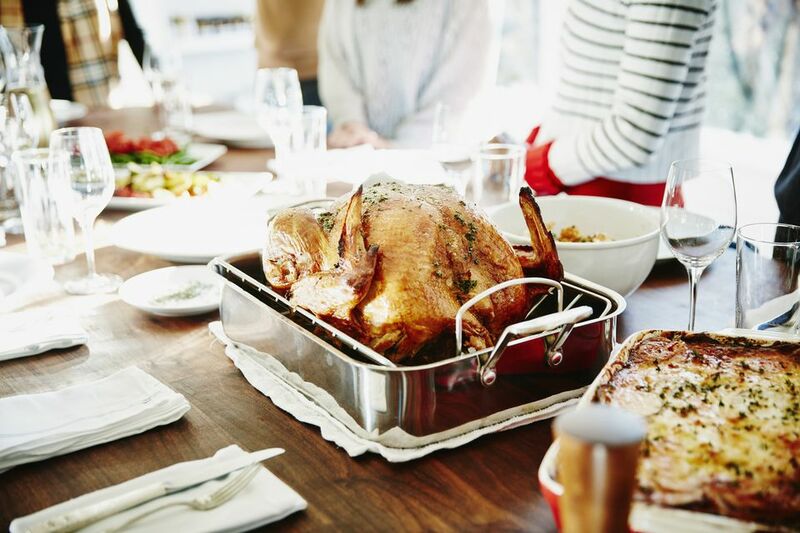 To help, we've provided some pros and cons to this popular turkey preparation. The pros are a well-seasoned and juicy bird. By soaking a turkey in a salt solution (yes, many brines also have sugar and spices, but without the salt you get nothing), the power of osmosis - where cells like to have similar water-salt balances - makes sure that the sodium in the brine gets infused throughout the turkey along with extra water. The cons are practical and, to some minds, culinary. First, on the practical side, it can be tricky to brine a giant Thanksgiving turkey, since it needs to be submerged in the liquid, so you need a food-grade container significantly larger than the turkey. A large cooler works, but a trash bag doesn't. Secondly, we approach the culinary reasons. As Harold McGee, renowned food scientist and experimenter once claimed, "you'd be angry with your butcher if he did it." Why would you not want your butcher to brine your turkey? Brining, or soaking meat in a salt-water solution uses the power of osmosis to force the turkey or other meat to draw up water into itself. The theory is that the meat ends up juicier and moister that way. The problem is that it is a fake juiciness. Real juiciness comes from the meat holding on to its own moisture, not holding onto some water (seasoned or not) in which it has been soaked. A butcher would do it to add weight to the bird. If the hassle of brining doesn't strike you as the be-all and end-all of turkey preparation, but you want that tasty, juicy goodness, there is an alternative called "dry brining", also known as "pre-salting". That's right, the well-seasoned effects of brining can be obtained with a simple blanket of salt. And what about the juiciness? For the same reason brining works—osmosis—so, too, does pre-salting. In this case, a well-salted turkey holds onto its own natural juices, leading to a moist, flavorful bird. To get effects similar to brining, the pre-salting needs to be done, much like brining, well in advance. The bird is big and needs to move the salt from the outside all the way through all of the cells. For the most flavorful turkey, consider salting the bird on Sunday, for your Thanksgiving feast on Thursday. That way it gives the bird 4-5 days for the salt to work through the cells. Cover the turkey—over and under the skin as much as possible—with about 1/2 teaspoon of fine sea salt per pound of meat. It will seem like a lot. Don't worry: most of it will fall or cook off. Use about 1/4 of the salt inside the cavities of the bird, and the rest over the entire turkey, working salt under the skin on the breast and thighs as much as possible. Put the turkey in a large bowl or roasting pan, cover, and chill for at least overnight and up to four days. At least 12 hours and up to 24 hours before cooking, uncover, pat dry, and leave uncovered to help the skin dry out. This will help ensure a crispy, brown skin when the bird is cooked. Roast your turkey as you see fit. One way that works well is to rub the bird with about 1/4 cup of room temperature butter, lay bacon or pancetta across the breast, pour about a cup of dry white wine in the pan, and start the whole thing off at about 400F. After 30 minutes, turn the oven down to 350F and roast—basting with pan juices and maybe 1/4 cup of port wine at a time every half hour or when it occurs to you—until the legs wobble and everything is fully cooked, browned and lovely. Then take it out, cover it with foil, and let it sit while you finish the rest of the dishes, usually about 45 minutes or so. Then carve it, serve it, and wait for someone to toast the chef.